I spend quite a bit of time on ebay scouring for great deals and rare items. Over the last two weeks I started noticing tons of sealed and rare games popping up from the same seller, rarebucky . I ask a few questions and come to find out he is a huge video game collector with over 3,500 games, has been on ebay since 1997, and is forced to sell some of his games to make more room. This is a Q and A session with rarebucky (Adam) to find out more about his collection, how he got so many sealed games, and his thoughts on game collecting in general. At the peak my collection was 3,500 games. But after all my selling is complete I will have 800 left. Why are you selling so many games? I just need more space. What is the most expensive game you have sold so far? 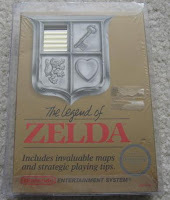 Zelda gold NES sealed for $500. That will change when I list the remainder of my sealed items in late August. I have a factory sealed TMNT Tournament Fighters for NES that will fetch quite a bit more than that. A large number of your auctions seem to be sealed games. Where did you get all of them? Various places. Most were bought new by me in stores, the rest were acquired over the internet (either through ebay or various forums) over the past 7-8 years. Why did you buy so many games new and never open them? Have you played them at some point or just keep them for collecting? Most of my sealed games were acquired over the past 4-5 years when I really got into collecting. I have opened copies of most games that I play. Why did you want to collect sealed games vs used games? Owning sealed copies of games I've grown up on to me, brings me back to those days. To me it's the definitive form of having a game you love, to know 100% for sure that the contents inside have never been used. Do you think your collection has increased in value? Probably. Despite what some people think not all games have gone up in value and I have lost money probably on 20% of my sealed items. On my used items it's almost all declined. Most of the Dreamcast, Saturn, Genesis, etc. that I sold were all bought new by me for $50-$60+ when they were released and some I sold for as little as $2. But I got enjoyment out of them so that's what counts. Are there any games in your collection you never plan on selling? Yes. I have a sealed Chrono Trigger and Final Fantasy III that I plan on keeping for a long time. Any closing advice for fellow collectors who are looking to sell their games too? Ways to get the most money? If you use ebay make sure to have a proper listing with a good title and good pictures. Ebay is raising fees so I think you're going to see fewer and fewer games on ebay. A good idea for vintage games is to use forums like digitpress.com and nintendoage.com as many of the collectors hang out there and best of all, no fees! Thank you Adam for answering these questions for us and good luck selling the rest of your collection. VGPC must be moving on up, it's getting exclusive interviews with game collectors now huh?